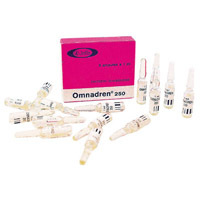 Omnadren 250 is a four-part testosterone blend. This preparation is quite similar to Sustanon 250, and is different only in that 100 mg/mL of it (of 250 mg/mL total) is testosterone hexanoate instead of the testosterone decanoate used in Sustanon. For this reason, Omnadren has a shorter half life, and will give a faster initial increase in blood level. This accounts for the claim of increased water retention and increased side effects, since levels, at first, are higher for the same dosage. Testosterone Hexanoate – 100 mg. The claim that it has a duration effect of “a good 2-3 weeks” is somewhat misleading since the half life of the longest lived component is only about 5 days. There is of course some effect 2 or 3 weeks after injection, but relatively little.The hexanoate ester is quite similar to the well known enanthate ester, but is shorter by one carbon. Less water retention and estrogenic side effects.